This campaign ended on April 19, 2019, but you can still make a gift to Drury University by clicking here! Help spread the word and help raise $100 or more and you qualify for your own #DruryDreamTeam T-shirt (pick up at Alumni Center)! Sizes range from s-xxl, but quantities are limited! Earn a Drury logo beach towel for sharing the campaign and helping raise $250 or more! Pick up at Martin Alumni Center. One pair of custom, limited edition DU socks! Give $200 or more and get two pairs of custom, limited edition DU socks! Gifts of $1,000 or more to the Annual Drury Experience Fund or unrestricted only - receive TWO pairs of custom, limited edition Drury dress socks and recognition in Drury's Harwood Society. Gifts of $2,500 or more to the Annual Drury Experience Fund or unrestricted only - receive an authentic DU jersey, TWO pairs of custom, limited edition Drury dress socks and recognition in Drury's President's Society. Gifts of $1,000 or more to the Annual Drury Experience Fund or unrestricted only – receive a custom Drury beach towel and recognition in Harwood Society. Must be picked up at Martin Alumni Center. We are inviting you to join the Drury Dream Team by making a gift today. Our Match Madness donors are matching gifts to the Annual Drury Experience Fund until the matching funds run out or until time runs out! You can even celebrate a special person by making a gift in their honor. Your gift supports student scholarships and helps make students’ Drury dreams come true. Every gift makes a difference for Drury and our students. There has never been a better time to make a gift! • Not only will your gift be matched for double the impact, we are drawing names again this year at the end of the campaign. ALL participating donors have a chance to have an annual scholarship awarded in their honor and will receive a Drury pennant decal. • You may qualify for some sweet Drury swag like socks OR for joining the campaign as an advocate and encouraging others to participate, you may qualify for a Drury Dream Team t-shirt. 1. Make a gift of any amount and it is automatically matched as long as matching funds remain! 2. Select your level of support and claim an incentive level for swag, recognition and chance to have a scholarship named in your honor. 3. Show everyone that you're on the Drury Dream Team! Check your email, follow the link and print your “jersey.” Take a selfie with your jersey and post to social media, “Join me on the #DruryDreamTeam” with a link to the campaign. Tag your friends and encourage your fellow classmates, friends, colleagues and family to participate! 4. Be an ALL-STAR and sign up as an advocate! Ask others to join you, track your impact and you could earn a Drury Dream Team t-shirt. Sign up at the top righthand corner of the screen, share on social and tag your friends. You can also text and email with the links below the video. If you have any questions on Match Madness, the Drury Dream Team or how you can have a bigger impact by joining as an advocate or adding your own matching gift, please contact Melanie Earl at advancement@drury.edu. Thank you for supporting Drury and our students! Everyone is welcome to participate and donors giving through mail, phone or email will also be included in the drawings and appropriate thank you gifts (quantities are limited), as long you make your gift from Feb 11-April 18, 2019 to the Annual Drury Experience Fund or unrestricted. The names for the honorary annual scholarships will be drawn at the end of Match Madness. They are unrestricted and will be awarded to students by Drury University – Office of Financial Aid. Donors with gifts of $1,000 or more will be entered into a drawing to have a Trustee Scholarship named in their honor for the 2019-2020 year. All donors making a gift of any amount will be entered to have their name drawn to be recognized for a $5,000 scholarship. All donors will be recognized at the appropriate level for their annual gifts during the 2018-2019 year in the Honor Roll of Donors. 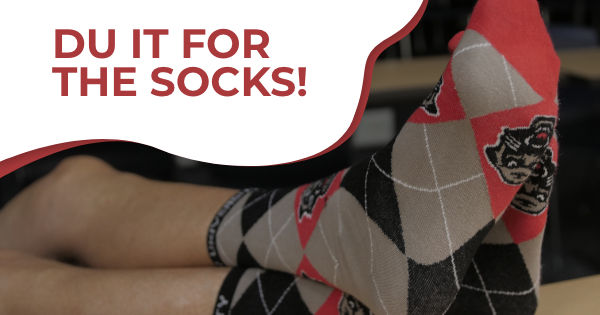 Socks are currently being limited to two pairs per household and will be mailed in March and April. T-Shirts are reserved for registered volunteer advocates and will need to be picked up at the Alumni Center; please contact us if we need to arrange to mail it. Thank you again for your support of Drury and our students!